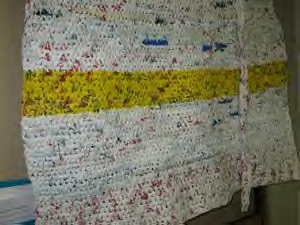 A bag mat is a three by six foot sleeping mat made by crocheting “plarn” (or plastic yarn) cut from shopping bags. Bags that often become trash are recycled into a portable, light-weight mat that can help a person who is homeless on the streets sleep better. Dottie Isbell, a Grayville resident, heard about the bag mat project from her daughter Kat Isbell, who has been working in recent years with nonprofits in Evansville, Indiana, to help end homelessness and poverty. Kat had found an online video (http://vimeo.com/4887139) from Lutheran Church Charities in Chicago and designed a how-to brochure for the project, then passed the instructions on to her mom. After learning how to make and crochet plarn into a mat, Dottie took the idea to the Grayville Senior Center. Norma Armstrong, Mary Handel, and Marcella Sweeney became involved in the folding, cutting, tying, and rolling of the plarn. Meanwhile, Dottie would crochet at the center with the group and at home. She uses an ice cream bucket with a hole in the lid to contain the plarn while doing a single crochet with a #10 hook. Several hours went into the production of one mat. Several months after the Grayville ladies completed their first bag mat, Kat met Stichweh, who attended a presentation she led through her job. She learned of his homeless situation through conversations with him. For several months, Stichweh has been homeless in Evansville after losing a well-paying job in another part of Indiana. He’s tried the men’s shelters and yet often sleeps out on the streets. He continues to look for work that can sustain him and help him afford housing once again. Isbell offered the bag mat to Stichweh, who accepted it and gave permission to share his photo, name, and comments. The bag mat project has already inspired other features and other individuals to involve others. Mary Handel had mentioned the project at the church she attends and Barbara Higginson, of Grayville too, was motivated to go to the Senior Center and learn to make plarn. She’s now working on a bag mat at home. Stichweh had ideas of enhancements to the bag mat. He wondered if a pillow could be made, with an open end, allowing other bags to be used for stuffing and for carrying things at other times. Dottie Isbell is working out a way to make a bag pillow based on his idea. Start a bag mat project yourself: 1) Find a homeless service provider who can connect your mats with those who can most use them; 2) Recruit team members for the various tasks; 3) Gather several regular-size plastic bags—even if there are holes; 4) Work together to CUT the bags, LINK the loops, ROLL the plarn, and/or CROCHET the bags into bag mats; 5) GIVE the bag mats away. Sept 2011 >> The ladies in Grayville, IL, have since donated the plarn they had cut, tied, and/or rolled to an agency in Southwest Indiana that involves people who are receiving Temporary Assistance for Needy Families (TANF) in the bag mat making project. The mats they make are donated to a homeless service provider in Evansville, IN. By 2013, Alan has been housed! Oct 2013>> Kat spoke at the Ignition Conference in Troy, IL, during the missions time, teaching over 170 middle school youth and their leaders to make plarn. In the days that followed, a ministry group from Troy United Methodist Church, called Chicks with Sticks, will be using the plarn to crochet bag mats that will be distributed to the homeless by the young adults during a missions project to come. This entry was posted in Ideas and tagged bag mats, crochet, ending homelessness, helping homeless, homeless, homelessness, housed not homeless, plarn, plarn sleeping mats, plastic bags, plastic yarn, recycle, recycling, recycling plastic bags, sleeping mats. Bookmark the permalink.